The reality of life is that we’re all waiting on something. Marriage. Babies. Jobs. Healing. Family restoration. Seasons of waiting on the Lord can be hard, discouraging and exhausting. Perhaps it’s only been weeks or months. But for some, the wait has lasted years. Or maybe you’ve faced an unimaginable trial, such as the loss of a loved one. The journey through grief, sorrow and pain can be filled with isolation and hopelessness. No matter how hard your journey has been, there is a purpose for all of the pain. Come join me in this 60-day devotional as I share pieces of my own story, including both loss and longing. Through the truth shared from God’s Word, you will find that it is possible to have joy and declare that God is good, even in the midst of waiting. As you read each devotion, my prayer is that your heart will be healed, your mind renewed and your spirit encouraged to seek, trust and praise the Lord through the storms you are facing today. Although it might be a hard journey now, God is faithful, and he will finish the work that he started in you. If you remain steadfast and don’t give up, in due time you will reap your abundant harvest! Be encouraged and have hope — God is in the waiting! 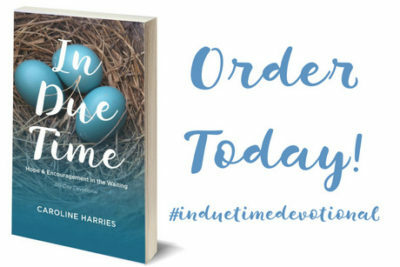 Order In Due Time Devotional HERE!